Video games have come a long ways. The glory days of arcades and early consoles brought with them several sets of video game trading cards. None were terribly ground-breaking. Even by traditional hobby standards, none have seen soaring values. But that doesn't mean their not fun and not worth collecting. Games have evolved a lot since the early 1980s. Early video game trading cards provide a glimpse back to a time where becoming a champion cost a quarter, heroes looked like collections of blocks and Donkey Kong was a bad guy. Here are five sets that reflect fondly on old-school video games. 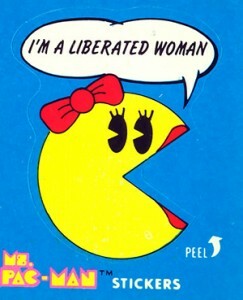 Pac-Man was one of the original video game superstars. 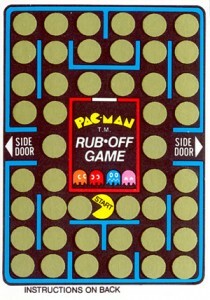 Fleer produced three different sets based on the franchise beginning with 1980 Fleer Pac-Man stickers. The set has 54 cards plus rub-off game cards that were meant to add an interactive gaming element. Packs come with three stickers, three rub-offs and a stick of gum. The stickers also have three different variations, presumably from different print runs. 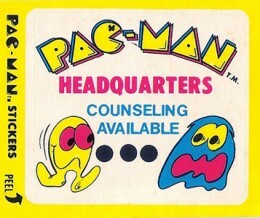 Other Pac-Man trading card sets include 1981 Fleer Ms. Pac-Man and 1982 Fleer Super Pac-Man. All three sets feature a couple of different styles of stickers. Many use the basic video game look while others are more detailed and cartoonish. They're also highlighted by corny sayings, several of which can be taken with double-meanings today. 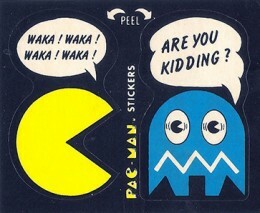 Shop for Fleer Pac-Man cards on eBay. For its first foray into the world of video game trading cards, Topps borrowed heavily from Fleer's Pac-Man sets. Stickers? Yup. Rub-off cards? Off course. Silly captions? You wouldn't want it any other way. Where 1982 Topps Donkey succeeds is with the artwork. Many of the cards have a fun energy about them. It's also got a Mario that looks very different from the one that would go on to become, arguably, the most famous video game character of all-time. 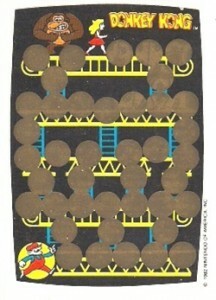 The 1982 Topps Donkey Kong set as 32 sticker cards and four rub-off cards. All are unnumbered. 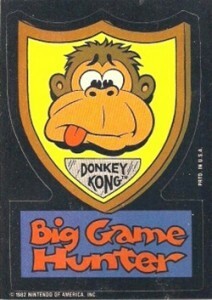 Shop for 1982 Topps Donkey Kong cards on eBay. 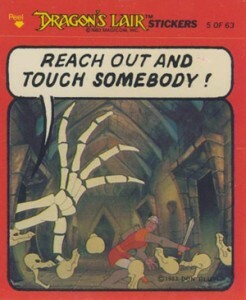 As far as early arcade games go, Dragon's Lair is one of the best suited for trading cards. The cartoon visuals make it a natural fit for the hobby. The base set has 63 cards. Most use shots from the game. The few that don't stick with sayings and achievements. Many also have silly captions to give them a little more personality. 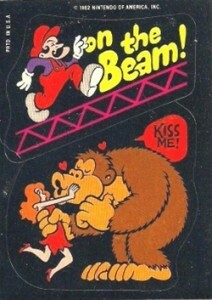 A lot of the humor was based in early 80s pop culture. Today, that will either lend to the nostalgic feel or fly right over peoples' heads. Like Pac-Man, there are also rub-off cards. 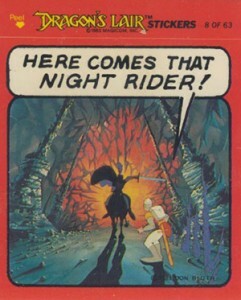 Shop for 1983 Fleer Dragon's Lair cards on eBay. 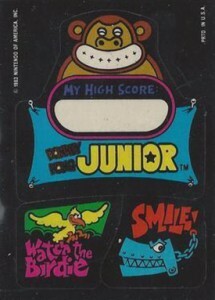 Stickers and rub-off cards were apparently essential for early video game trading card set. 1983 Topps Video City sticks with the same focus. Packs feature three stickers and three rub-off cards. 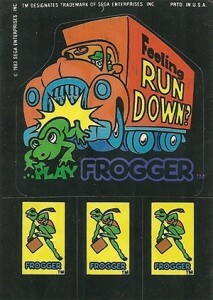 However, the set focuses on four popular games from the day: Frogger, Donkey Kong Junior, Zaxxon and Turbo. 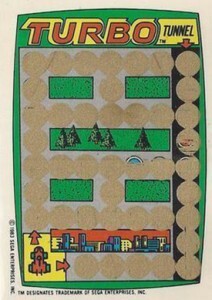 Each game has seven different stickers plus one rub-off card. The original sell sheet also mentioned Q-Bert and Centipede but neither made it to the final set. 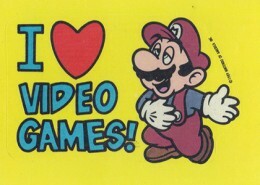 Shop for 1983 Topps Nintendo Video City cards on eBay. When it comes to video game royalty in trading cards, it doesn't get any bigger than 1989 Topps Nintendo Game Pack. The release includes stickers and scratch-off cards from six of the biggest console games ever: Super Mario Brothers, Super Mario Brothers 2, Double Dragon, Punch-Out, The Legend of Zelda and The Legend of Zelda II. 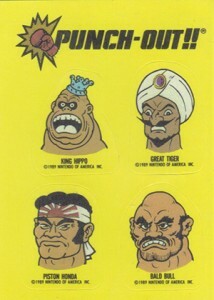 The stickers are considered by most to be the base set. It has 33 different stickers that focus largely on characters and sayings. Backgrounds are bright yellow, but it's the old-school characters most will focus on. It's a simpler look that a lot of other earlier video game trading cards but the nostalgia runs deep with so many great games covered. 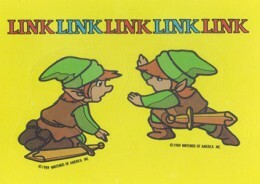 Similar to a lot of other video game cards, backs offer game hints and tips. Each of the six games in the set also has ten different scratch-off cards. Shop for 1989 Topps Nintendo Game Pack cards on eBay. In recent years, more video games have gotten the trading card treatment. 1993 Topps Sonic the Hedgehog is one of the most popular. Relatively rare, sets can sell for $50 or more. 2007 Topps Halo went for a more modern approach that included sketch cards. Enter-Play has been the most active maker of video game trading cards. In recent years they've done releases for several different Mario games, Zelda and even Nintendogs. Topps jumped back into video games with Skylanders Giants cards and stickers. 36 Donruss Donkey Kong 1982 Unopened Wax Packs. Some Packs Are Mis Wraps. Get 4x (FOUR) Vintage 1982 Donkey Kong Wax Packs Rare! Walter Day’s trading cards are also out there – and focus on the gamers, locations and people involved with and contributing to gaming worldwide.